Kyle Muntz is the author of four novels, most recently Green Lights (CCM 2014), and also the writer/designer of The Pale City, an independently produced role playing game for PC. 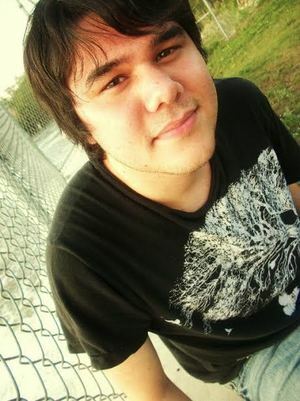 Follow him on Twitter at @kylemuntz. Edward J. Rathke: Tell me about the process of getting Green Lights to publication. I know you wrote the initial draft several years ago and then basically rewrote it and cut out a lot of content a few months before publication. How has it changed, from first version to the version we see now? 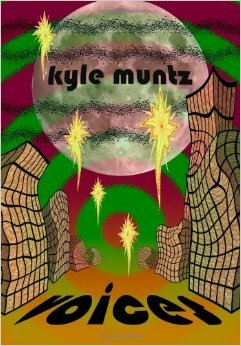 Kyle Muntz: I originally wrote Green Lights back in 2009. It was a much denser book, and deeply theoretical—almost to the point it was more a philosophical treatise than a novel. Over the years I’ve become increasingly unhappy with “experimental fiction,” and though I really liked the original version of I felt like there was something better buried inside it. I’ve done three full rewrites of the book. In particular I wanted to cut everything that didn’t relate to the characters or their feelings, but also to maintain all of the ideas that were in that much longer piece. EJR: I actually read your novel Voices the same day I read Green Lights. They’re very similar, in a way. 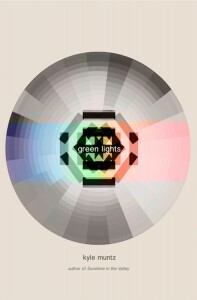 Green Lights is far less formally and structurally experimental, but they deal with a similar headspace, I think. They remind me a bit of Dhalgren by Samuel R Delany, and especially how clear the vast chasms between people can be. How would you compare these two novels? KM: I’d say there’s a lot of overlap, even if they’re about very different things. Green Lights has a similar aesthetic: both of them are fragmented and take place in abstract, mythologized versions of the real world, and are structured more around a narrator’s interaction with other people than a plot. Retrospectively, I think I’ve developed a few different modes as a writer, and my starting point in Green Lights was to revise certain aesthetic elements and moods from Voices. One main difference to me is that Voices is a young-person novel. I wrote it was I was 17, and it’s the last book of mine that I would consider very personal, whereas a defining element of the writing I’ve done afterwards is that I want it to be separate and different from me. Green Lights is also a lot more playful, and aimed towards a clearer style like Genichiro Takahashi or Richard Brautigan, whereas Voices is closer to concrete poetry with narrative, and the language in general has a very raw feeling to it. EJR: Speaking of Delany, we’ve talked often about how we used to write pretty experimental stuff but are moving away from that. How has your style transformed over the years? What are your goals as a writer now? KM: To me Green Lights is a sort of bridge between “experimental” and narrative writing, and the last novel I’ll ever publish that develops that kind of style. My older writing is very focused on form and ideas, but recently I’m much more interested bringing characters and narrative to the front, and writing as clearly as possible. I’ve also become much more interested in genre fiction, and the challenge of working in intensely strange settings that are still coherent. My larger aesthetic project is maybe an investigation of narrative shape and how characters relate to their world (always as part of it, rather than stand-ins for the reader), and also an attempt to write in as many different genres as possible, usually in a very different style. Right now I’m shopping around a bizzaro comedy; a surreal samurai novel; and a subdued, character driven piece of magical realism set in a world where the Christian god exists…which I guess is the kind of territory I’m trying to cover, haha. EJR: What do you think are the limitations of experimental fiction? KM: This is a tough question, but I do think modern writing that labels itself as experimental has some problematic elements, especially as it’s practiced in the small press. One problem is that the culture around experimental writing is actually a kind of traditionalism: heavily invested in the lineage of texts, and focused on developing aesthetic tendencies from modernism or postmodernism that are labeled experimental mainly because of their difficulty finding a larger audience. The reliance on seminal texts produces an interesting kind of historicity, but despite how influential Pynchon, Gaddis, Barthelme, Beckette, Joyce, etc, have been for modern experimental writers, I think writers self-consciously positioning themselves as adding to a canon (that mysteriously cut off 20 years ago) does more harm than good. The other element was an issue of honesty, since it’s no secret that deconstructing language, form, and narrative isn’t always as fun as it sounds. It’s unpopular even among the small group of people interested in this “literature” thing we do (or, more often, pretend to do and fail at), but I think this kind of work demands an amount of energy and attention that mostly doesn’t exist in the small press. Very difficult books are still being read, but I’m not sure many readers are interested in seeing more of them from obscure writers—because like, who has time for some crazy niche thing when they still haven’t gotten through Infinite Jest or Wittengstein’s Mistress, or Blood Meridian or whatever? Even very serious readers are probably more likely to spend the rest of their time watching True Detective or Game of Thrones or something. In the end, probably more than they dedicate to reading. In the end, for me very language-driven writing was sort of like cocaine. As a reader, over the last few years it just hasn’t gotten me as high as it used to. Recently I’ve just been wanting to tell stories and make things I like, without any idea of what’s serious or important or necessary. I was especially bothered by a long transitional period where the stuff I was writing was different from what I wanted to read, though I think that’s mostly over now. Somewhere in About Writing, Samuel Delany argues that it’s possible to write about even the most complex things clearly and accessibly; and if not, you’re probably doing something wrong. I’m not sure that’s always true (as there’s definitely a place for obscure/difficult writing in the world), but it’s something I’ve been trying to implement in my own writing. Then again, there are a lot of ideas of what constitutes “experimental writing” and this is one of the more subdued, so I’m not sure I’ve ever been an experimental writer by most standards. It was a popular word about five years ago and it’s been interesting to see the stigma rising up against it more recently. I guess I should add that Green Lights is my attempt to unify these two approaches, and the stuff from this question is mostly what I had in mind while editing it, haha. EJR: It’s interesting since I feel like we both began as more experimental writers and have been moving towards narrative and character around the time we met each other. And all those novels sound so great. You still need to send me the Samurai one. Anyrate, you have a novella coming out called The Crippled Giant that I was lucky enough to read. How does this fit into your transition from experimental to narrative and genre? KM: The Crippled Giant was my first longer commissioned piece, and the first time I’d been allowed to write SF knowing I’d have a place to send it. I’ve been interested in the genre for years but hardly written it—originally because THAT’S NOT LITERATURE but ultimately because it’s hard to place less commercial SF. It’s a story about a village built on the body of an immense, mostly dead biomechanical giant, which seems to be the last place in a decaying world. But in the end it’s mostly a character-driven story about a young girl with a dead father and her adoption by the leader of the villager. It starts with a skull being peeled like a flower and kind of goes from there. EJR: We talk pretty often about genre fiction, and we recently discussed Aye, and Gomorrah by Samuel R Delany at Entropy. Thinking about the limitations of experimental fiction and indie lit, in general, what can SFF do that these other genres can’t? Or, to put it simpler: why genre fiction? KM: I’ve become interested in imaginative fiction in general because I think it does things other genres can’t. Years ago, though it’s not technically considered a genre story, I read Tlön, Uqbar, Orbis Tertius by Borges and was never as impressed by anything set in the real world again, and it kind of reminded me why I was interested in storytelling before I ever discovered literature. I think genre is more difficult to write (with the new issues of maintaining consistency, tone, and immersion in a setting that doesn’t exist and has never existed) but has a lot of potential. It’s also pretty badly represented, by movies in particular. People have the idea, for example, that there’s only one way to tell a time time travel story with small variations; one alien story (always an invasion); one dystopian story. Really there’s so much more you can do with SFF, and I’ve been wanting to do a few of those things. EJR: Along with all the writing, you’ve been creating a computer game for almost two years, yeah? Let’s talk about The Pale City. First, what made you want to make a game? And what have been the biggest challenges? The funny thing about The Pale City is it wasn’t originally my idea to make a game, though the partner I was with split off about a year ago. Mostly it’s a chance to try out all the things I enjoy in a very different medium. One challenge is I think games are ultimately about manipulating place, and it’s a very different way of looking at narrative, as every bit of the story has to be about going somewhere and doing something; but overall the challenges have mostly been technical, since I went into it with no programming background and I’ve had to learn like 10 new sets of skills. Another thing is the time, since it’s been thousands of hours and I still have a lot more to do. The script is about 50,000 words so far, but it’s only been 5% of the work, maybe less. I’m definitely making a game aimed at slightly wider audiences, so there’s a big shift in the writing. It’s also very different from most RPGS, and I’m constantly wondering whether the stuff I’m doing will even work, but I really like the way things are turning out so far.